What does blockchain technology mean for real estate in Canada? You can spend days, weeks researching how blockchain is going to change business modeling, in particular commerce. There is a lot of deja-vu happening going back to the late 1990’s when entrepreneurs and businesses were chasing how to embrace the new internet. The race is on and we’re still in the very early days. First off, let’s make one thing absolutely clear: do not confuse blockchain with cryptocurrency. There are over a thousand cryptocurrencies that have been born, and it is because of these that blockchain technology has surfaced. It is a huge game changer in how commerce, record keeping, content, manufacturing, voting, identity, etc. will be managed and verified. The commonality in all of these applications is that blockchain will provide the ability to exchange at a faster frequency with 100% security, at lower cost, 24/7. Delivering on this vision is what is being figured out right now, hence the race to define the industry’s future leaders. Within real estate, there are multiple blockchain application possibilities. To start, there is the transfer of property between a buyer and seller. This involves a financial transfer of funds, title transfer, legal conveyance, mortgage financing, strata and condo records, appraisals, assessments, land surveys, and inspections. For the majority of transactions, there is also the listing and sales processing through the real estate boards, currently operated through the MLS. All of this is just surrounding the exchange of property. Other real estate related applications are data sources, government records, land development, ordinances, assemblies, refinancing, zoning, licensing, regulators...the list goes on. I can confidently state that as an industry, we all believe there’s room for greater efficiency across these departments and applications. Each require verified access to data and record keeping, and if they can be faster, at less cost, available anytime, without the threat of tampering, it’s hard to argue against that. An associated term you will hear often is what is called ‘smart contracts’. Smart contracts are the security around each transaction, allowing for full transparency without the threat of tampering or fraud. 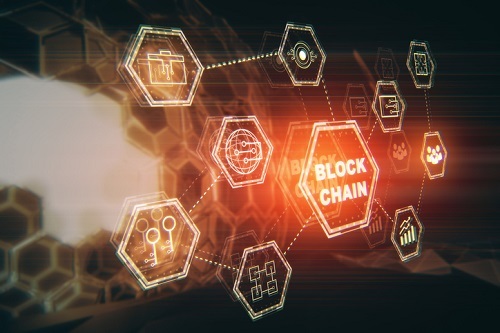 In a real estate transaction, blockchain will provide the proof of ownership and smart contracts will process the transfer of assets with reduced threat of litigation. Access to this information can be made available to anyone, or encrypted should you wish to limit access. So, who are the first movers in real estate looking to claim ground in the blockchain revolution? Venture capital is hovering and placing their bets. Governments and small to large companies around the world are embracing blockchain technology. The UK government plans to move the country’s land registry to blockchain by 2022. In the U.S., entrepreneurial companies like Propy, Imbrex, ShelterZoom, Ubitquity, Smartrealty and Harbor are all out of the starting blocks looking to carve out their position in real estate with various business models. Digitizing land titles, sales transactions, government records, MLS, fractional real estate investments are all on the horizon. In Canada, Polymath out of Toronto is building an exchange platform using blockchain to securitize investment assets including real estate into security tokens (ST’s). These are different than utility cryptocurrencies like Bitcoin or Ether because they will be regulated and backed by an investment asset, then traded amongst retail and institutional investors. In Vancouver, there’s start-up IMBY, who are looking to tokenize real estate property and then make it available for consumers to buy and sell within an exchange platform. Canada currently sits third in the world in blockchain start-ups, but keep in mind, as Canadians we tend to be very methodical and particular on regulations. Hence, slow to adopt. The eventual winners will be those that demonstrate and provide the most trust in their brand promise. Keep in mind, that big companies like IBM, Microsoft, Amazon, Google, etc. are all massively investing in blockchain technology to keep ahead and remain relevant. It is and will be the next big business revolution. It’s exciting to follow and I’m sure the next Facebook, AirBnb or Expedia is incubating right now. Ian Martin is Director of Industry Development for REW.